I don’t know if was via an early reading that jarred with my younger self’s sensibilities or due to some misunderstanding on my part of information gleaned from unknown sources but I somehow had developed the impression that Jon Cleary’s Scobie Malone novels were not for me. The character, I thought, was some kind of laddish yob and the books of a type that would make me cringe. Only this month’s reading challenge from Past Offences to review a book written in 1987 could prompt me, reluctantly, to track down a copy of the fourth novel in the series. I was truly astonished then to find myself utterly engaged by a protagonist of depth and character in a novel of intelligence and humour that observes its chosen slice of Australian society and culture with a keen eye and sharp wit. Who knew? He suffered fools, because there were so many of them, but not gladly. His election as President for life was no more than a formality, like high tea, monogamy and other European importations, and was looked upon as just as much a giggle. …His stubbornness, his total distrust of the police jacketed him in an attitude that would eventually bring him to disaster. For a moment Malone felt sorry for him, but it lasted only a moment: pity, they had told him years ago, should never be part of a policeman’s equipment. They had been wrong, of course, but he had learned to use it sparingly. …It was difficult to be militant in a country that ignored you. Equally believable are the high level political shenanigans that form the backdrop to Malone’s investigation. The state’s first independent body examining public sector corruption would be established one year later and a Royal Commission into entrenched police corruption would follow a a couple of years after that so it doesn’t take a genius to realise that Cleary’s depictions of back room deals and other grubby behaviour were at the very least plausible if not based on things he knew to be true. Finally I suppose I should make mention of the story which, although thoroughly enjoyable in its own right, has taken a back seat to other elements of the novel for me. We learn early on that an international assassin is responsible for the attempt on Timori’s life but the investigating team must still catch the man and attempt to find out who is financing his work so there is much suspense to be had even without the more dramatic chase passages which really ratchet up the tension. I’m generally happy enough to read a book about which I have no expectations but these days rarely bother to even start a book I don’t think I will like. Life is too short after all. But reading DRAGONS AT THE PARTY has reminded me that I should not base my expectations on misguided notions picked up from…heaven only knows where. My only criticism of the book is some clunky exposition that can only have been added for the benefit of international readers (no adult Australian needs to be told that Perth is the capital of Western Australia or what the ABC is for example) but that I suspect that is more due to publisher pressures than the author’s own wishes. I’ll be making up for my personal neglect of this author in the not too distant future. The time has come for Officer Scobie Malone to leave the Homicide and Serial Offenders Unit of the Sydney police. His last investigation could be the most bizarre case ever to land upon a policeman’s desk. The time has come for Scobie Malone to leave the Homicide and Serial Offenders Unit of the Sydney police, and his last investigation could be the most bizarre case ever to cross his desk. Called in when a housemaid is found dead in a dotcom millionaire’s penthouse, Scobie suspects he’s dealing with a kidnap that’s gone wrong. In fact, it couldn’t have gone more wrong. The kidnappers thought they had grabbed the millionaire’s girlfriend — how were they supposed to know he liked slipping into her designer dresses when she wasn’t around? Christian Rodka’s brilliant narration added great pleasure to listening to this novel. There is quite a cast of characters and his voice portrayal made picking one from the other relatively easy. 4.7, DEGREES OF CONNECTION which was Jon Cleary’s last Scobie Malone novel, following on from THE EASY SIN. There are passages in this novel which crack a smile, despite the seriousness of the story line: an abduction and a couple of murders thrown in for good measure; a gang that by any standards is incompetent, but at the same time amoral. I thought some of the characters were overblown and parts of the plot definitely unrealistic. On the other hand the collapse of the dotcom bubble pointed to how ordinary Australians lost money in a world financial phenomenon. And then for Scobie Malone fans, historically this was his last case at the head of Homicide and at the time they must have wondered what Jon Cleary was up to. With hindsight we know he was preparing to bow out of crime fiction. pale metal caterpillar – all for the benefit of one dead passenger. sound of 1,000 American lawyers attending an international conference. 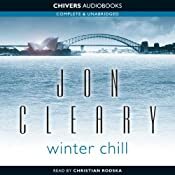 #12 in Jon Cleary’s Scobie Malone series, CID police procedurals set in Sydney, that reflect current events such as the building of the Sydney Opera House and the holding of the Sydney Olympics. Against the background of an international conference for lawyers being held in Sydney, an American lawyer who turns out to have been born in Australia is killed. His body is discovered on the monorail and then the security guard who discovered the body is murdered. There’s quite a bit of human interest in the story too. Scobie Malone has two teenage children and his wife discovers she has breast cancer. Scobie Malone is a principled detective who believes in thorough investigative techniques. A good story made even better by the excellent narration of Christian Rodska.Quite an intricate plot. 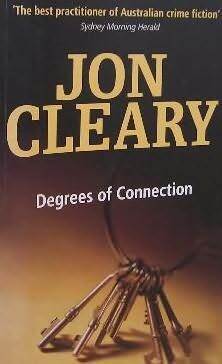 In 2004 Cleary (1917-2010) won a Ned Kelly Award for best novel for the last of the Scobie Malone books DEGREES OF CONNECTION. He also won an Edgar Award for Best Novel in 1975 for a non Malone novel PETER’S PENCE. Jon Cleary was probably better known for the fact that he wrote THE SUNDOWNERS. Wikipedia has a good listing of the Scobie Malone books with single sentence plot outlines. Cleary once stated that, “There’s more than a bit of me in Scobie. We both come from fighting Irish stock, we’re both from Erskineville, the wrong side of the tracks, and both of us slugged our way up.” Malone was a Catholic family man with rigid principles who mostly worked in Sydney, although his adventures occasionally took him overseas. Malone’s Dutch wife Lisa, who he first met working as Sir James Quentin’s secretary in The High Commissioner. She was based on Cleary’s wife Joy. Malone’s partner Sergeant Russ Clements, who eventually became head of Homicide. His father Con and mother Brigid (based on Cleary’s parents). His children Tom and Maureen (based on Cleary’s grandchildren). Sadly I have only one or two of this series, and that really is something I should correct.